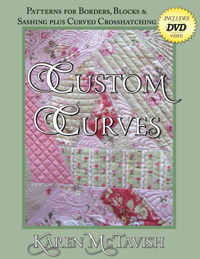 Custom Curves is a pattern book which includes a DVD teaching Curved Crosshatching and features special guest, Ronda K. Beyer! Patterns for borders, blocks, corners, and sashing, plus curved crosshatching for everything else! Custom Curves ~ Patterns for Borders, Blocks and Sashing plus Curved Crosshatching by Karen McTavish offers you 128 unlimited use designs, including 5 complete wholecloth designs from 27 original elements to help you make truly unique quilts. On the included DVD, Karen invites one of the quilting world's best innovators, Ronda K. Beyer, to teach her curved crosshatching technique. Together they teach a 65 minute lesson. No matter if you quilt by hand or machine, the designs and lessons in this book will inspire you to express your artistic talents through quilting. Just like in The Secrets of Elemental Quilting, the patterns in Custom Curves will be unlimited use. You may use these patterns as many times as you like in any of your artistic or custom quilting ventures. This book is softcover, 96 pages, 128 unlimited use patterns, and includes a 65 minute DVD. It retails for $24.95. I've been buying Karen's books since her first appearance on Simply Quilts. I have every one of her books and DVDs. All of Karen's work is so inspiring and her instructions make it very easy to follow! The DVDs are extremely helpful especially for those of us who learn by watching. I have watched her DVDs many times and will continue to plug them in anytime I need that extra inspiration or just to watch the beautiful quilting! The patterns in her books are so beautiful! You can be as simplistic and/or as complex as you would like to be when making a design so the versatility is wonderful! Karen's recent book Custom Curves continues to provide yet another excellent addition for my growing library of her work. Karen has been a big inspiration in my machine quilting life. Thank you Karen for all of the time and effort you put into making your books and DVDs, they will continue to be a great resource of mine for many years to come! Thought you might like to see one of your designs painted. I was playing around with some new Pro Chem paints and quilted up one of your designs to try them out on. I just posted it on facebook. You have some beautiful designs here. Wish I had had you sign your book. Note: This is the wholecloth design from page 62 of Custom Curves. Click on the image to enlarge. Although we haven’t met, you have certainly been an inspiration to me! I'd like to share with you a small wholecloth/whitework quilt that your books and videos helped make possible. So far I have Mastering the Art of McTavishing, The Secrets of Elemental Quilting and Custom Curves as well as one of Ronda’s curved crosshatch rulers and used things I learned from all of them to design this quilt. Your other two books are on my wishlist and I think I’ll be ordering them soon! You should be able to see my post of this quilt on quiltingboard.com. I thought you might enjoy seeing how I’ve used your books & videos. I have just purchased your new book and it is amazing as are all of your books. When I opened the "Whitework" book my jaw dropped and remained that way until the third flip through the pages. The DVD's with the books gives the hope of success for the rest of us. Your teaching methods are clear and with practice we can all learn to be quilters. Thank you for your inspiration and I look forward to any new books in the future. I am from England and have all your books even the latest Custom Curves which I am very excited about the lovely designs and Ronda's Rulers which I ordered and have. I just wanted to say thanks. I could not have made my latest quilt "Wedding Ring", made for my hubby Jim, and achieve the standard that I have without your books, youtubes, etc. I thank you so much for the wealth of info you have shared with us all. I have used trapunto in the white centres, my very first attempt, easy with your very accurate instructions [in The Secrets of Elemental Quilting]. Once again thanks for sharing your wonderful talents.